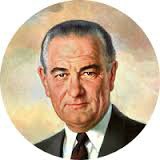 Lyndon Johnson was the first President to show tax return. 36 other Presidents did not. 37 if you count President Trump. Lefties, get off it. We don't care. He is rich. We don't care. His family has done well financially. We don't care. He is brash. We don't care. His hair looks funny. We don't care. He is not politically correct. We don't care. The left erroneously portrays him as a bigot. We don't care. He has improved the hostile environment for the middle class. We care about that. If we were to vote on Trump's second term right now, he would win again. The relentless attacks against him just convinces me that we made the right choice. Take a long hike on a short pier. He is our President and doing exactly what he said he would do. We like that! How long has it been since any President has done anything that even resembles keeping promises?